Never miss a payment! My Bills++ is the only app you need to track all your bills, when they are due and to notify you ahead of when they are due. There is no need to miss a payment or pay a late fee. Let My Bills++ do the heavy lifting for you so you can focus on your busy life. * Dashboard/Today Widget Whenever you launch My Bills++, you will be showed the payment dashboard. Quickly see what bill payments are past due and what are coming up. From the Dashboard, you can flag a payment as paid, make a partial payment or even change the amount for an upcoming bill. If want to delete a payment, you can do that to. * Bill Tracking Enter in all you bills. You can set interval to repeat a bill so there is no need to enter in bill information more than once. Enter in phone numbers, account numbers and websites. My Bills++ can call these phone numbers right from within the app. You can setup bills to auto pay as well. No need to manually go in and tend to each and every payment if you don’t want. * Alert Notifications For each bill you can setup to be notified a number of days ahead of time. You can also pick the time of day to be notified. We understand that you lead a busy life, when you get a push notification, you will have the ability to snooze the alert to show again at a later time. 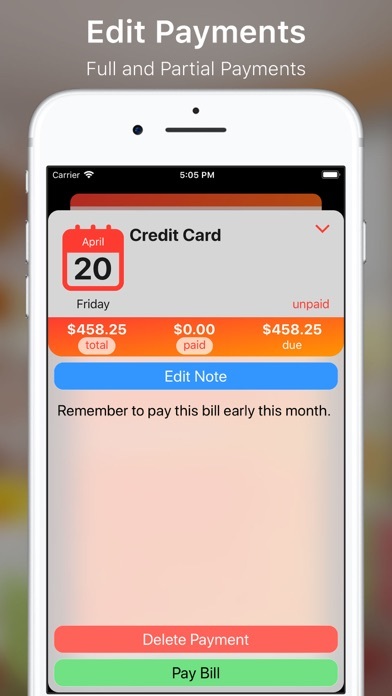 * Calendar If you prefer to see your bills visually, use the built in calendar view. 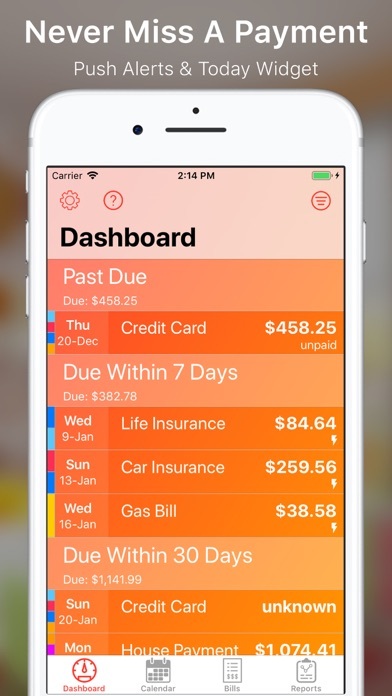 At a quick glance you can see what days have bills due. 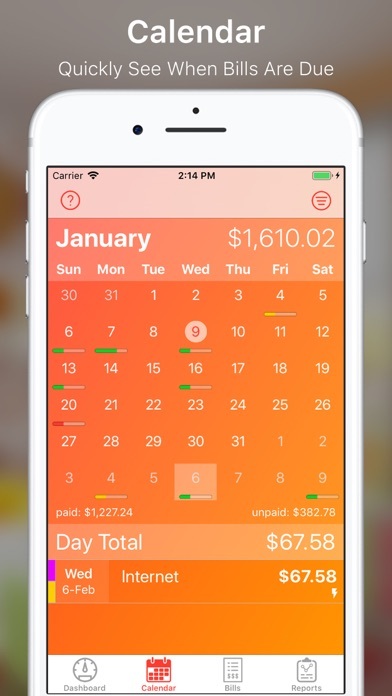 You can also see visually how many bills needs to be paid and if there are large bills due on a specific day. * Reports Let My Bills++ tell you where you money is going. My Bills++ has robust line graphs and beautiful pie charts. Setup as many report templates you need. Look all all your bill or a specific category - it's up to you. 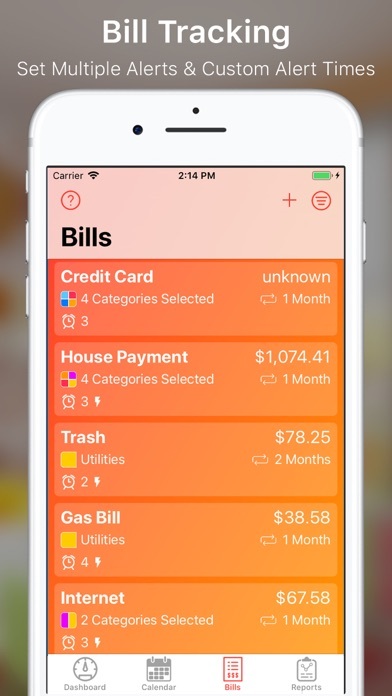 *Category Filters Assign each bill to one or more categories and filter the Dashboard, Bills or Calendar view to only show the bills for the selected category. 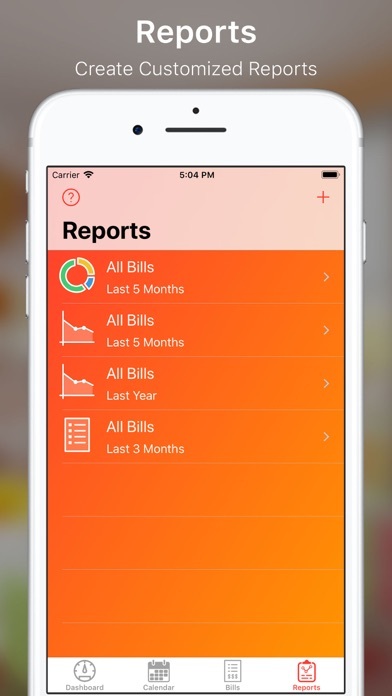 * Automatic Sync/Backup My Bills++ uses your iCloud account to store your data. There is no need to account logins or backing up your data. In fact, syncing between device using the same iCloud account is seamless and automagical. * Security My Bills++ has built in security. You can enable a pin code to access the app. You can take this one step further by enabling Touch ID so you can get into the app with just your finger. 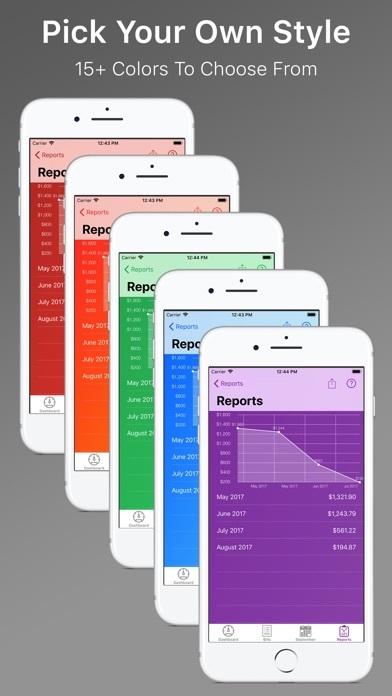 * Drag and Drop (iPad) My Bills++ fully supports iOS 11’s drag and drop on the iPad. 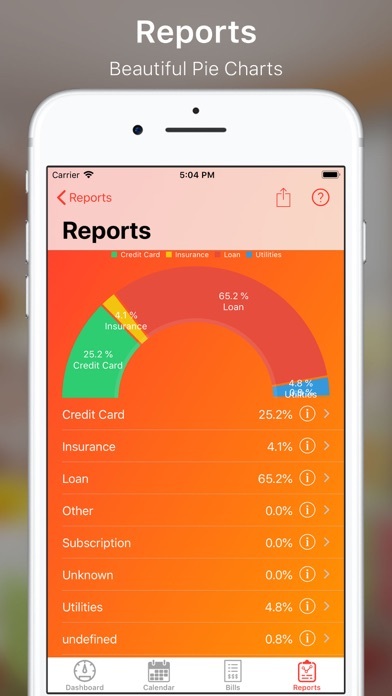 Drag out payment, bill and report information into whatever app you need. * Themes My Bills++ has many color schemes to choose from. Don’t like the default orange? Pick something that better suits your style. We are certain that My Bills++ will meet all your needs. So, make the leap with Jump Gap Software's My Bills++.